May 5, 2016 – NASA’s New Horizons spacecraft has sent home the first compositional data about Pluto’s four small satellites. 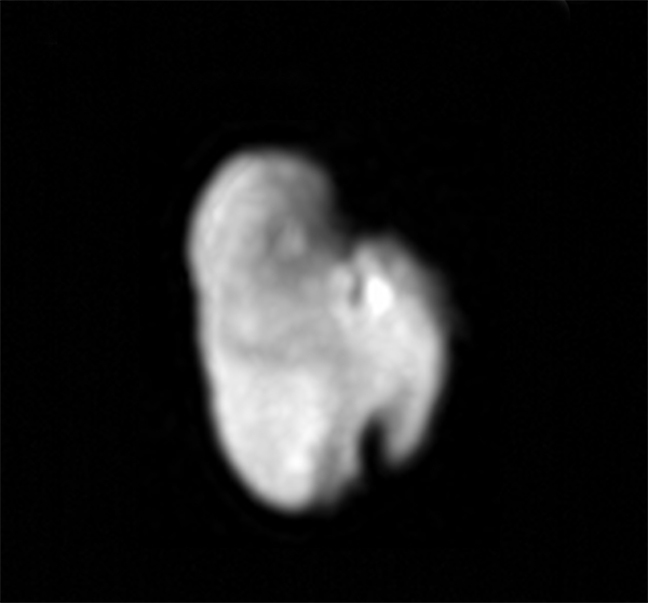 The new data show the surface of Hydra, Pluto’s outermost small moon, is dominated by nearly pristine water ice – confirming hints that scientists picked up in New Horizons images showing Hydra’s highly reflective surface. The new compositional data, recently received on Earth, was gathered with the Ralph/Linear Etalon Imaging Spectral Array (LEISA) instrument on July 14, 2015, from a distance of 150,000 miles (240,000 kilometers). The new data – known as infrared spectra – show the unmistakable signature of crystalline water ice: a broad absorption from 1.50 to 1.60 microns and a narrower water-ice spectral feature at 1.65 microns. The Hydra spectrum is similar to that of Pluto’s largest moon, Charon, which is also dominated by crystalline water ice. But Hydra’s water-ice absorption bands are even deeper than Charon’s, suggesting that ice grains on Hydra’s surface are larger or reflect more light at certain angles than the grains on Charon. Hydra is thought to have formed in an icy debris disk produced when water-rich mantles were stripped from the two bodies that collided to form the Pluto-Charon binary some 4 billion years ago. Hydra’s deep water bands and high reflectance imply relatively little contamination by darker material that has accumulated on Charon’s surface over time. The New Horizons science team is looking forward to obtaining similar spectra of Pluto’s other small moons, for comparison to Hydra and Charon.